Respiratory infection is usually caused by a virus and not a bacteria this is the main reason why anti biotics seldom work for this ailment apart from weakening the immune system. This infection also known as kennel cough and can be brought on where a group of dogs are in close proximity of each other. This infection is caused by various airborne viruses. 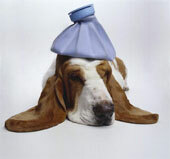 Stress and a weakened immune system can off course make the dog more susceptible to the virus. Dogs can have a hoarse like cough made worse by barking runny eyes and nose and lack of appetite. To treat the cough as it can be sore a herbal cough medicine can help as well as Vitamine C in 500mg or 1000mg depending on the size of the dog. I also like to add Moducare or Echinacea to boost the immune system as well as 1/4 teaspoon of cod liver oil. Vit A and E can be used in the right dosage too if you are not using the Moducare or Echinacea. A steamed room is a great way to treat this infection too with leaving your dog in a closed bathroom. Try to keep your dog separate as this is very contagious. This could last 14 to 21 days and takes up to 10 days to show symptoms. Apart from being uncomfortable to the dog it is not really a danger to your dog except if your dog already has got other under lying illnesses and a very weakened immune system and old age.